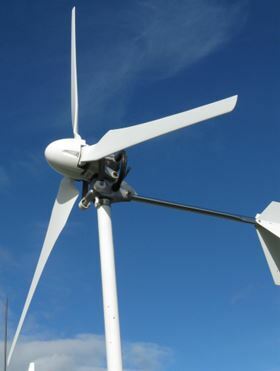 Natural fibre reinforced plastic blades have been used for a rooftop wind turbine. The blades were conceived, designed and manufactured by the SWE (Endowed Chair of Wind Energy) at the University, the team having found that Biotex Flax reinforcement’s twistless technology gave them the performance characteristics that they were looking for. SWE’s research is focused on improving the reliability of turbines whilst reducing the production costs of wind energy. It started design in 2011, with the aim of constructing new rotor blades for the university’s 1kW rooftop wind turbine. After a trip to “The Eden Project” in the UK, the team wanted to familiarise themselves with natural fibres and contacted Composites Evolution to test the performance of its Biotex materials. Once completed the blades were assembled onto the rooftop turbine for performance tests. SWE plans to use the blades in further tests focusing on their strength performance compared to blades constructed from other materials. A fourth blade was embedded with strain gauges and the team will be comparing the results to standard carbon and glass blades. The completed blade will be displayed at the Composites Evolution, Hall 7.2, stand E6 at JEC Europe in Paris 11th – 13th March.